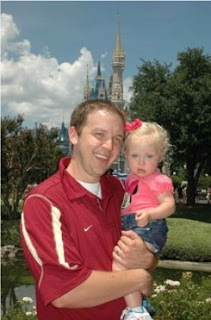 I am sure alot of you are thinking.. how much can a 1 year old little girl do at Disney's Magic Kingdom? The answer.. ALOT. This was my first experience taking a little one to the park. I myself was wondering, what can she really do? I asked my friends Mike and Tina (who are seriously Disney experts). They told me that there is tons for her to do. They gave us a schedule and breakdown of where we should go.. what Fast Passes to get.. and how to efficiently see the park. Justin and I were all into their little plan... and it worked PERFECTLY. We didn't wait in line for longer than 15 minutes. The park was somewhat crowded.. so I have to really give them props.. and Justin for running all around collecting the Fast Passes. I don't have the best memory, but I am going to give you a recap of their plan.. how we executed it and some pictures to show the proof. Wow, this sounds like a real CIA mission. I will have to tell you.. Justin was taking notes when Tina and Mike were telling us what to do.. and I was getting a little stressed thinking.. can we really pull this off... Oh yes, we did. We did fail to complete their first suggestion.. get to the opening gates in time for their opening celebration. I didn't even know the opening celebration existed until I read this blog. I asked Tina about the opening celebration and she said that she highly recommended it. Tina and Mike have only been to the opening celebration once (they are not morning people). Tina told me that she cried the time she saw it. If something could be so exciting as to bring my friend to tears.. I didn't want to miss it.. but we did. I blame it on Justin's latte.. and he blames it on me taking too long to get ready.. either way.. we missed it by 10 minutes... maybe next time. Here we are on Main Street.. we just walked into the park..
Kate and my dad. This whole trip was his idea. He has been wanting to take her since she was born..
That one little mishap (missing opening celebration), did not keep us from fulfilling our mission to see the Magic Kingdom in a very efficient manor. We had a one year old for goodness sake.. and were not about to wait in lines for hours. The first thing on our schedule - Go to Dumbo, have me wait in the line while Justin gets Fast Passes to Peter Pan. We only waited about 10 minutes. Here we are at Dumbo.. Yeah!! Finally on the ride.. Please excuse the pictures of me.. I don't think I took one good picture all day! 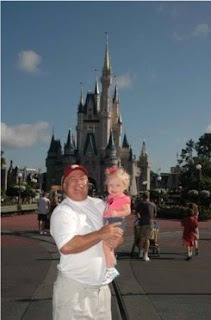 One reason I write this blog is for Kate.. so I wanted to include a couple pictures of me..
My dad took Kate on the Tea Cups..
Then we rode on the carousel.. We were getting everything in.. killing time until our Fast Passes to Peter Pan were good. After the Carousel.. Justin went to get Fast Passes for Winnie the Pooh. Here is Kate and Justin getting on the Peter Pan ride. We walked right on... I LOVE the Fast Pass! After Peter Pan we decided to take a break, get something to drink and rest for a minute until our Fast Pass for Winnie the Pooh was good. Here is Justin and Kate on the Winnie the Pooh Ride. We walked outside after our ride to see the real Winnie the Pooh. Kate's first character experience. We had no idea how she would react. She did ok with the first picture. After we left Winnie the Pooh, we headed to Toon Town. Minnie's house was Kate's favorite. I loved to watch her and her curiosity. 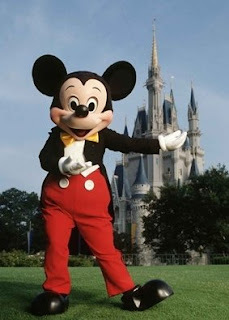 Here she is in front of Minnie's house. On Minnie's sewing table.. she is going to be like her great-grandma. Minnie's fridge.. Kate is checking out what she has. This was Kate's favorite place in the house.. the green room. It was not easy getting her out of this little space. After Toon Town.. it was lunch time. We seriously got a lot done in the first few hours. Justin went to the Jungle Cruise and got a Fast Pass for us while we were finishing up eating. 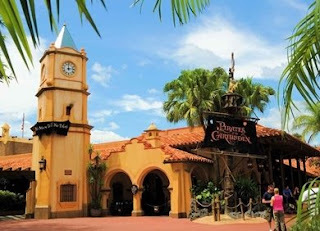 After lunch we went to Pirates of the Caribbean. This was the longest line we waited in. I think we waited about 15-20 min. I had not been on it since they added Johnny Depp's character. We enjoyed it. It was amazing how much the mechanical character looked like Johnny Depp. After the Jungle Cruise, we went to the Tiki room to hear the Tiki birds. I used to love the Tiki room, but they redid it... and it was not so enjoyable for me anymore. Kate did manage to fall asleep. She was so tired and our poor little girl did not get her morning nap in. We heard that the Baby Center in the Magic Kingdom was really nice. After the Tiki room, Justin took Kate to the baby center while my dad and I stopped by the Dole ice cream stand. This was definitely a highlight. They have this pineapple and vanilla ice cream and floats. I had a pineapple float.. it was amazing! A definite must- if you ever go. We got one for Justin and met him at the Baby Center. I was amazed at how clean and nice it was. Of course, Kate woke up as soon as Justin got to the Baby center, but we did take a little rest there. As we got later in the day my picture taking seriously dropped off... 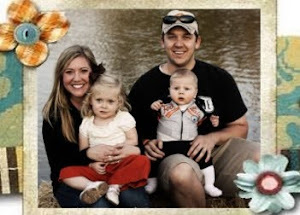 Here is Justin and Kate outside of the Baby center. This is one of my favorite pictures. Next we headed to the Country Bear Jamboree. I think by this point.. anything in air conditioning sounded good to us. That was not as good I remember it either. Dear Disney people - PLEASE UPDATE the Country Bear Jamboree. Kate was the most difficult at the Jamboree. All she wanted to do was run up and down the isle.. probably a main reason I didn't enjoy it.. Oh, and we were all getting tired. After the Jamboree, we got a great spot for the Parade. Kate sat in her stroller for the entire parade. I did not think it would keep her attention, but it did. We were all so tired.. it was about 3:30.. and time for a nap. We headed back to the hotel to lay down. We slept until dinner. We went to dinner at a The Wave.. it is in the Contemporary Hotel. The restaurant had a cool atmosphere and was so relaxing and quiet. 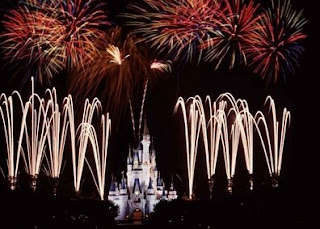 No, I did not take those photos.. but they do a great job of describing the firework show. I was afraid that they would scare Kate, but she did fine. It was a great show! 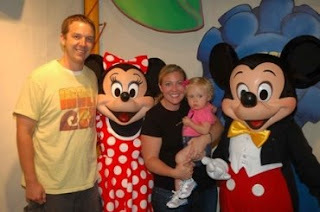 I really wanted Kate to take a picture with Mickey Mouse. The wait earlier in the day was 45 minutes.. and I didn't want to wait that long. We decided to go after the fireworks, thinking that all the people with kids would have gone home.. we were wrong! We waited about 30 minutes to take this picture... poor Kate.. I hope she likes me when she grows up.. I am sure I am going to drive her crazy! After we left picture taking.. we walked outside to a monsoon. It was POURING!! At that point, I about lost it.. Justin ran to the nearest gift shop and bought an umbrella and poncho. As soon as he got back to us.. it started drizzling. Justin is sure that Disney turned on some faucet.. to increase poncho and umbrella sales... He was not happy, but now we have a cute Mickey umbrella and poncho. Just for an FYI.. I highly recommend Tina and Mike's Disney plan. It worked out great for us. I couldn't believe how much Kate could do. It is truly a wonderful place. 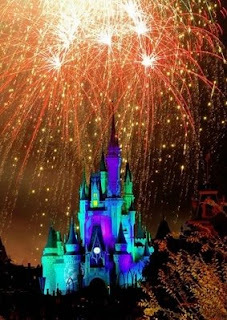 What makes Disney so magical? The people, the atmosphere and most of all... this mouse. I can't wait to go back! We're going to be going this Sunday. Really wish you guys were here so we could go together! not to brag, but we went to the opening celebration once and maxx and millie were chosen to wave the magic wands to open the park and then got to ride on dumbo... maxx with mickey mouse and millie with minnie mouse. and then later that day, they were chosen to decorate a cake with all the pooh characters at the crystal palace (we LOVE to eat a nice quiet lunch there). i took SO many photos and a lady approached me in the bathroom at the crystal palace and asked if maxx was in the "make a wish program" since we were getting so much special attention. she also asked me if i scrapbooked, since i had such GREAT memories from that day... and you know the answer to that question!!! Hi! Thanks for your article. We're taking my 15-month old next week and it's good to know that it can be done! I've gone to Disney since I was a preschooler but I'm a bit apprehensive taking my son for the first time. Thanks for the advice!